I typically don't share recipes here, but this was so easy and delicious that I couldn't resist. I am a complete sucker for Greek fare. Avgolemono soup, tzatziki sauce—anytime! I modified this recipe slightly from an *emeals.com recipe to make it even less work for me. 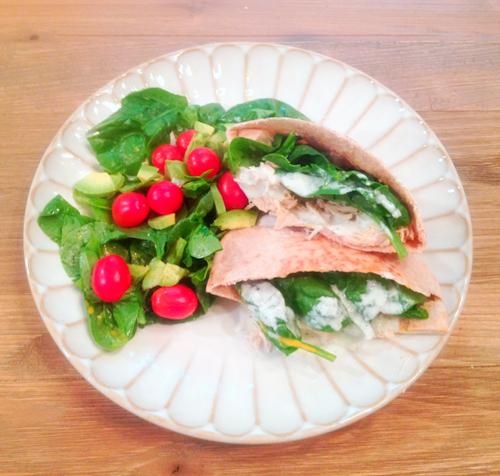 Anyhow, here is my greek chicken pita recipe with quick Tzatziki sauce. Super quick, yummy and healthy. This recipe serves two people. 1/2 mall red onion, thinly sliced. Pop the chicken in a crockpot with some chicken broth (I used low sodium) and Greek seasoning and cook on low for 6-8 hours. It will be deliciously tender! Combine yogurt, cucumber, dill, garlic, vinegar, lemon juice, salt & pepper, 1 t of olive oil in a blender and blend until smooth. Warm pitas via method of your choice (I popped in microwave for 10 seconds) and then layer chicken, salad and sauce on top of pita or stuff them inside of pita. Garnish with the rest of your salad. YUM! *(Have you heard of this site? It's my new fave. For $5 a month I pick the eating style of my choice—clean eating for us—and the amount of people I'm cooking for and they send me a menu and shopping list each week. I love that they repeat ingredient use so you don't buy a lot of things you use once. And the recipes are all pretty quick). Emails did not pay or ask me to endorse them, FYI.